I don't care much for the character of Hercules (in Marvel at least; I could go either way on the Greek myth), so I was prepared to feel absolutely nothing for this figure. I bought it for the Annihilus piece, and was totally ready to just throw it into a box somewhere. But it's still on my shelf. One of the very few divine immortals currently active on Earth, Hercules is also among the most powerful super hero, rivaling even the incredible Hulk in strength. Son of the ancient god Zeus and a mortal woman, Hercules has lived for nearly four thousand years, and has witnessed much of human history. As a defender of both Earth and Olympus, he is an expert in almost every form of hand-to-hand combat, with exceptional skill in classic wrestling and archery. Recent troubles have separated him from the wealth of Olympus, and he has been forced to take jobs with the superhero clean-up crew Damage Control. Many collectors were unhappy with the switch of the Marvel license from ToyBiz to Hasbro, and Hercules was an outlet to vent their anger. Many attacked his cheese-eating grin. While I'm not a huge fan of the grin, I realize that it's not Hasbro's fault, since ToyBiz's sculptors were responsible for this series, and all foreseeable ML sculpts at this time. The grin fits Hercules, but it really pins the character into a mood. He doesn't look right charging into battle grinning like a monkey. The rest of the sculpt isn't bad. The upper body is big, bare and muscular, and Hercules's sash is a separate piece. I'm pretty sure this is so his bare, unmarked torso can be reused for later shirtless figures, so don't be surprised if this becomes something of a standard body for large-but-not-Hulk-large figures. He's got a little loincloth held up by a big belt with an "H" embossed on the buckle. Subtle. By far the coolest part of the sculpt is the straps that run up his legs, from ankles to mid-thigh. They look really nice and do a little to separate this figure from some generic shirtless smiling hero archetype. The paint is pretty good. There are a lot of thin lines where you'd expect slop, but there's not much to be found. Of the 14 leg straps, only one has any real inconsistency in the paint line, and it's not much. 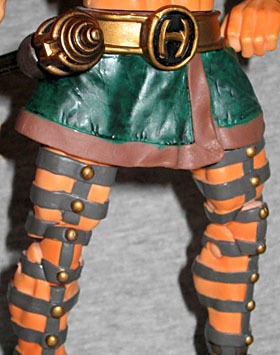 His green sash and loincloth are trimmed with brown, and there's not much slop to speak of their either. The veins on the arm are a little weird, but this has always been a problem in Marvel Legends. Another odd point to note is that his eyebrows and mustache are a slight shade lighter than his beard and hair. It's kind of strange but I can live with it. There are various gold accents on the headgear, belt, arm bands, and leg straps, and they all look nice. The articulation is mostly up to ML standards, with a few exceptions. Herc has a balljoint in the neck, balljoints in the shoulders, peg biceps, double-hinged elbows, balljoints in the wrists, a chest hinge, a peg waist, balljoints in the hips, peg thigh, double-hinged knees, and hinged and pivoting ankles. It seems when articulation gets sacrificed, the first joint to go is the shin peg. 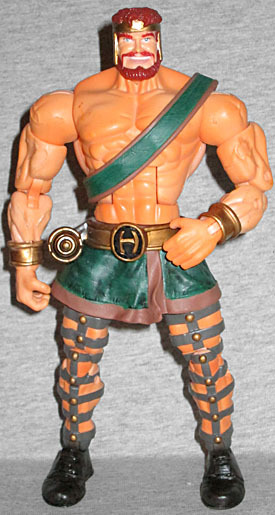 Sometimes the figure makes up for it with balljoints in the ankles, but not Herc. Some may lament the loss of finger joints and midfoot hinges, but I say good riddance. The midfoot hinge usually just hindered the figures' ability to stand, and all my ML figures with finger joints always had trouble holding anything. You just can't get a solid grip on something when the figure has tiny finger joints. And Herc has precisely one thing to hold. It's a scepter or maybe a club. I told you I don't care about the character right? Anyway, it fits into a loop on his belt and, more importantly, the head of the staff is clear on the inside. It's like looking through a tiny, blurry window of thick clear plastic. Woo hoo! 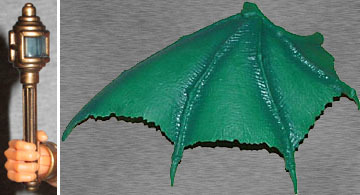 He also gets the left wing of Annihilus, which is big and green and spiny. It doesn't move anywhere, but it's got a balljoint at one end so you know it'll do its share of moving once you connect it to the body. There's not really much more to say about ol' Herc. I'm not any more interested in the character than I was before I bought the figure, but the figure itself is better than I expected it to be. 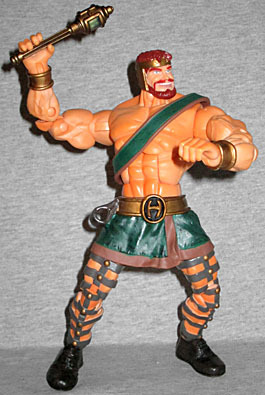 Fans of Herc might be a miffed about the goofy grin, but if you can get past the facial expression, there's a lot to like about this figure.